In other pages of this www.stokowski.org site covering acoustic recordings of Leopold Stokowski and the Philadelphia Orchestra, recordings of the music of Tchaikovsky, Wagner and Rachmaninoff have their own pages, as well as of French music and Russian music. This page is of the last three years of Stokowski - Philadelphia Orchestra acoustic recordings not covered on those other acoustic recording pages. By 1922, acoustic recordings, and in particular Victor Talking Machine Red Seal records had audibly improved compared with the recordings of the 1910s, including the first Philadelphia Orchestra recordings of 1917. However, they were still restricted to a narrow band of frequencies, about 250 Hz to about 2,500 Hz, or with the best operators and equipment, perhaps to 2,800 Hz. This was effectively a range of about the E or F below middle C, or about 190 Hz to about three octaves above middle C, which is about 2,100 Hz 1. 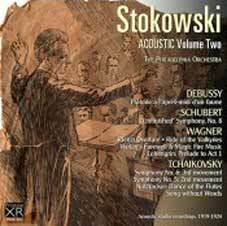 The acoustic recordings featured on this www.stokowski.org page and the other Philadelphia Orchestra recordings of 1920-1924 will likely sound to our ears today as being primitive and at times perhaps like what some have called "an orchestra of banjos". However, given the physical and technical challenges of achieving a satisfactory recording during the acoustic era, they remain remarkable. Remember that only 67 sides of more than 450 recorded sides by the Philadelphia Orchestra during the acoustic years were approved for release by Stokowski. However, these Philadelphia Orchestra recordings demonstrate not only the superior recording results usually achieved by Victor, but also the superiority of the Philadelphia Orchestra of that time, as compared with other U.S. and European orchestras of which we have surviving recordings. The Philadelphians under Stokowski achieved a level of tonal beauty, precision, virtuosity, and ensemble not typically matched by those other contemporary orchestras, at least as we may judge from recordings. Consider as an example the contemporaneous 1923 recording of the great conductor Felix Weingartner (1863-1942) recording with his usual London group, the London Symphony Orchestra. On June 1, 1923, they recorded the Beethoven Symphony no 7 on nine sides for (British) Columbia. Of course, given the limitations of the acoustic process, this was not the full London Symphony, but rather a smaller number - perhaps 35 to 45 musicians grouped in front of the recording horn. However, one would suppose these to be some of the best of the London musicians. Yet, listen to the excerpt from the third movement of the Beethoven symphony, and note the poor intonation, slurred and wrong notes, and the recurring break-down of ensemble playing. This excerpt is by no means a "worst-case" example of the contemporary quality of playing. Amateur orchestras today, in North America, Europe, and elsewhere routinely surpass this poor level. 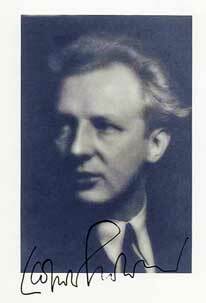 It is easy to understand why many critics enthusiastically welcomed the qualities of the Philadelphia Orchestra under Leopold Stokowski. Click on the link, below to listen to (download) this London Symphony Orchestra example from 1923, and then listen to the other Philadelphia recordings of 1922-1924 on this page. 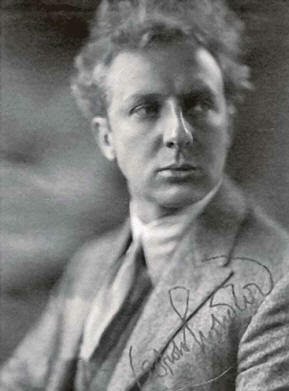 On 9 January 1922 (unsuccessfully) and on 28 January 1922 in the Camden Church Studio, Stokowski recorded what may have been his first recording of what eventually became many famous series of Stokowski orchestrations or transcriptions of works not originally written for symphony orchestra. This was an arrangement of the third movement of Luigi Boccherini's String Quintet in E major, opus 11 no 5. G 275. Of course, Stokowski's first two recordings of the Brahms Hungarian Dances no 5 and no 6 are arrangements of works for piano four hands, but these were established works for orchestra played by many groups. They also do not seem to be specifically orchestrations by Stokowski, although the instrumentation was changed to adapt to the acoustic recording process. Also, in the case of this recording, the minuet from the Boccherini Quintet played by a symphony orchestra or large group was far from exclusive to Stokowski. The encyclopedia catalog of acoustic recordings by Claude Graveley Arnold 2 lists 11 acoustic recordings of this Boccherini piece prior to Stokowski. Rather, Stokowski's many arrangements of works by Bach, Boccherini, Chopin, etc. added new orchestral works which Stokowski apparently liked, and wanted to make available to his audience in his performances. According to the scholar Rollin Smith 3, 1922 was also the year of the first Stokowski transcription of a Bach organ work for full symphony orchestra, the Passacaglia and Fugue in c minor BWV 582 . This Boccherini morsel was, however, recorded more than a dozen times in orchestral arrangements by orchestras throughout the acoustic era. However, the 1922 Stokowski - Philadelphia Orchestra recording is certainly one of the best, and also the best played of the versions I have heard. Stokowski and the Philadelphia Orchestra also recorded this Stokowski transcription again in 1929 (click here to read about the 1929 Boccherini recording). This minuet from the Luigi Boccherini String Quintet opus 11 no 5 was issued on a 10 inch (25 cm) Victor Red Seal disc 66058, matrix number B-25943-4. In Europe, the Gramophone Company issued the recording on 10 inch disc catalogue number 2-947. Stokowski instructed that the recording be labeled "Celebrated Minuet". The orchestra of 38 musicians was the typically reduced complement of acoustic recordings of symphonic works, then: 7 first violins, 5 second violins, 3 violas, 2 celli, 4 double basses, 1 clarinet, 2 flutes, 2 oboes, 4 horns, 2 bassoons, 1 tuba, 3 trombones, 1 harp, and 1 percussion traps. On 6 November 1922 in the Camden Church Studio, Stokowski recorded another of his transcriptions, that of the Chopin Prélude in e minor opus 28 no 4 for piano. In my view, this is one of the more successful Stokowski orchestrations or transcriptions, in part because the instrumentation is light. This recording is also successful since the primarly instruments in this case are in the acoustic recording range of reproduction. The Philadelphia Orchestra performance is dignified and precise, with an amount of string portamento typical of that era. This recording was not immediately issued as a Victor Red Seal single sided disc, but was rather coupled on Victor 1111 with the 1924 Tchaikovsky 'Song without Words', another Stokowski transcription. This Chopin transcription, although only 2 minutes long was apparently difficult to record successfully, since Stokowski and the Philadelphians made 1 takes of the work on 10 April 1922, 2 more takes on 13 April 1922, again 2 further takes on 29 April 1922, and 2 takes, numbers 6 and the Stokowski-approved take number 7 on 6 November 1922. This seems to have been typical of the difficult and somewhat unpredictable acoustic recording process, in some was more an art than a science. Although the Chopin was successfully recorded in November 1922, and the Tchaikovsky 'Song without Words' with which it was eventually coupled bein g recorded in April, 1924, this disc was not released by Victor until late in 1925, after the new electrical recording process had been in place for some six months. For this reason, and perhaps also because of the light musicial content - orchestrations of quiet, contemplative piano works, this Victor 1111 did not sell well, and today is difficult to find. This short work, only about 2 minutes in length, remains interesting today in its introspective nature, a good reflection of Chopin's original, yet in some ways benefitting from orchestration to give a full voice to this introspective tone. Stokowski re-recorded this Chopin transcription in 1950 with 'His Symphony Orchestra' on a Victor 33 RPM disc LM-1238. Click on the link below to listen to this interesting 1922 recording. Another Stokowski transcription was the German Dance D. 783 by Franz Schubert Stokowski instructed that the disc be labelled Viennese Dance, perhaps due to concerns about a continued anti-German sentiment which had been so strong in the US during the First World War. (You might be interested to read about the shocking arrest in Boston and internment of the great conductor Karl Muck when he was conductor of the Boston Symphony during the First World War by clicking here.) Unlike the Boccherini orchestration, and to a lesser extent the Chopin transcription, both performed by a number of other symphony orchestras during the acoustic era, this Stokowski transcription was one-of-a-kind by him and not emulated by other conductors of other orchestras. This recording was made on Monday, 4 December 1922 in the Camden Church Studio. It followed unsuccessful recording sessions of 9 October 1922, 6 November 1922, 13 November 1922, and two takes on 4 December 1922, take 7 being authorized by Stokowski. The recording was issued in August 1923 on Victor 12 inch (30 cm) Red Seal disc 74814, matrix number C 27012-7, and in Europe by the Gramophone Company on disc catalogue 3-0912. The orchestra used in this acoustic recording provides an insight into the recording techniques used by Stokowski and Victor to overcome the limitations of the acoustic process. There were 43 musicians: 7 first violins, 4 second violins, 3 violas, 2 celli, 2 oboes, 1 English horn, 2 bassoons, 1 contrabassoon, 2 clarinets, 3 trumpets, 3 trombones, 4 horns, 3 flutes, 1 tuba, 1 baritone horn, 1 bass clarinet, 1 saxophone, 1 harp, 1 percussion. The tuba the saxophone and the bass clarinet were to provide the bass support, since string basses did not effectively record with the acoustic process (notice that there are no string basses in the recording orchestra). The contrabassoon and perhaps bass clarinet were used to replace the tympani which could not be used in acoustic recordings, since its rapid onset percussion could cause the recording stylus to leave the wax recording matrix. Stokowski's label for this work 'Viennese Dance' was certainly appropriate for this performance, since the sway of the music has a grace and Viennese lilt that remains georgeous even to this day. This must have been a delightful recording to play on the acoustic Victrolas of the day. The sound is particularly effective for the acoustic process. The playing and performance is relaxed, yet effervescent - what a joy, and one of the highlights of the 67 acoustic sides of Stokowski and the Philadelphia Orchestra to have survived for us. Click on the link below to listen to this memory of a past playing style. This recording was issued on Victor Red Seal 74814 (12 inch/30 cm single side) disc and in Europe by the Gramophone Company on 3-0912 (12 inch/30 cm single side). Richard Kaplan in his fine Philadelphia Orchestra discography 6 notes that this is the only Victor Philadelphia Orchestra recording issued only in a single-side format and not later reissued as a double sided disc. 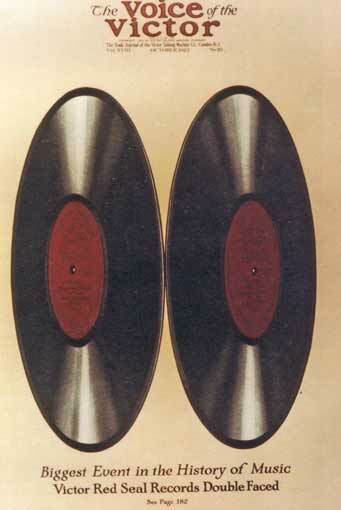 On 21 September 1923, Victor for the first time introduced what they termed "Double Faced" Red Seal discs, having a record surface on both sides of the disc. The Victor Black Seal discs had been double faced since 1908 4, but Red Seal discs had not been, due to the difficulty to gain a revised royalty agreement with the classical artists. Victor advertised this as the "Biggest Event in the History of Music". Although perhaps overstated, the fact that Victor sold these double faced Red Seal records at only a slight premium over the single-faced disc price was in effect a significant price cut, and a major savings for the music fan. It was perhaps also what economists would likely refer to as a test of "price elasticity of demand". In fact, the introduction of the double sided disc helped Victor sales in 1923 to slightly recover from the sales drop experienced in 1922. The year 1924 marked the end of the acoustic recording era for Stokowski and the Philadelphians, with the introduction of the electrical process beginning the next year (although the orchestra did not know of this in 1924). Also in 1924, Stokowski and the Philadelphia Orchestra made their first recording of a complete symphony: the Schubert "Unfinished" Symphony in b minor D 759. This symphony of course was performed many, many times in Europe and in the US, and not only by Stokowski, but also his Philadelphia predecessors. 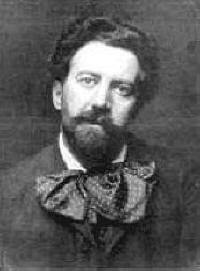 As an example, in its 1882 - 1883 season, the Germania Orchestra, a predecessor of the Philadelphia Orchestra under William Stoll performed the Unfinished Symphony in May, 1883. 5. This also was by no means the first acoustic recording of a complete symphony. Artur Nikisch and the Berlin Philharmonic recorded their famous complete (although cut) recording of the Beethoven Symphony no 5 on eight sides in November, 1913. There were also a number of other complete symphonic recordings in the decade prior to Stokowski's Unfinished, including 'complete' versions of the Unfinished by Leo Blech and the Berlin Philharmonic in 1922 and Adrian Boult (pre-knighthood days) in 1923. However, the practice at the time by nearly all orchestras and recordings was to record one movement of a symphony, and often heavily cut to fit on one side. Stokowski's acoustic recordings of the heavily cut second movements of the Beethoven Symphony no 8, or the Dvorak New World symphony, or of the third movement of the Tchaikovsky Pathétique are typical of this. This recording has many of the usual acoustic rearrangements, with a reduced complement of 39 musicians used in the recording: 7 first violins, 4 second violins, 3 violas, 2 celli, 2 oboes, 2 flutes, 2 clarinets, 2 bassoons, 4 horns, 2 trumpets, 3 trombones, 1 tuba, 1 baritone horn, 1 contrabassoon, 1 baritone saxophone, 1 harp, 1 percussion. Notice again that no string basses were used, with the bass line doubled by the contrabassoon, tuba and the bass clarinet. The contrabassoon also substituted for the absent tympani. The contrabassoon taking up the string bass theme can be heard clearly throughout, such is in the first few minutes of the symphony. Regarding the bass clarinet, not so usual in symphony orchestras, in the Stokowski Fans Yahoo group, I read an account by Lawrence Matheson, a Stokowski fan and expert, recounting a conversation he had with Janet Frank who had been a cellist with Stokowski's American Symphony Orchestra. She said that Stokowski had added a bass clarinet to the orchestra for the Schubert Unfinished, when performed by the American Symphony Orchestra in the 1960s. Perhaps this was inspired by his experience with these acoustic recording arrangements. This is a very good performance, well played and satifying. However, it perhaps lacks that ultimate transforming passion of some of the best of the literally hundreds of later recordings of the 'Unfinished'. Stokowski's own 1927 electrical recording is more vital. Yet this 1924 recording is also significantly better than the other two acoustic 'Unfinished' Symphonies I have heard by Sir Henry Wood and Leo Blech. One advantage is that the Stokowski 1924 recording of the Schubert Unfinished was on 6 sides, and is complete. Most acoustic recordings of the Unfinished were on four sides (not to mention the frightening prospect of the several two sided issues). The effect of these cuts, required to fit the symphony onto four sides can be witnessed in listening to the 1923 recording by Sir Henry Wood and the New Queen's Hall Orchestra on English Columbia. This recording replaced the identically numbered 1919 Wood recording on Columbia L1360 and L1361, but with new matrix numbers 76518-3, 76519-4, 76520-4, and 76521-4. Cut from 1923 Wood recording is several minutes of the minor key build-up of the theme rising to the yearning recapitulation of the initial theme of the symphony 2 1/2 minutes into the symphony. The 1924 Schubert Unfinished was issued on three double faced 12 inch (30 cm) Victor Red Seal discs catalogue numbers 6459, 6460 and 6461. Matrix numbers were: C-29052-5, C-29053-5, C-29054-5, C-29055-4, C-29056-5, and C-29057-5. It was issued in Europe on Gramophone Company Gramophone DB-792, DB-793 and DB-794. 1 Intervals and Notation found at http://mathandmusic.tripod.com/notes.htm accessed 2009. 2 Arnold, Claude Graveley, C.S.B. The Orchestra on Record, 1896 - 1926, An Encyclopedia of Orchestral Recordings Made by the Acoustical Process. Discographies, Number 73, Greenwood Press, Westport Connecticut. 1997. ISBN 0-313-30099-2. 3 Smith, Rollin. Stokowski and the Organ. Pendragon Press. 2004. ISBN 157647103-9. 4 Bolig, John R. The Victor Red Seal Discography Volume 2: Double-Sided Series to 1930. Mainspring Press. Denver, Colorado. 2006. ISBN 0-9772735-5-5. 5 Gerson, Robert A. Music in Philadelphia. Theodore Presser Co. Philadelphia. 1940. 6 Kaplan, Richard. The Philadelphia Orchestra - An Annotated Discography. Rowman & Littlefield. London. 2015. ISBN 978-1-4422-3915-9.